Surrounded with horrors, we got used to them and went on living like that. Among those horrors, things happened that were done by people who knew each other, people who, until yesterday, had lived almost as family members together. In Bosnia, a neighbour means more than a relative. In Bosnia, having coffee with your neighbour is a ritual, and this is what we trampled on and forgot. We lost ourselves in hatred and brutality. And in this vortex of terrible misfortune and horror, the horror of Srebrenica happened. Dragan Obrenović, Guilty Plea Statement, 30 October 2003. 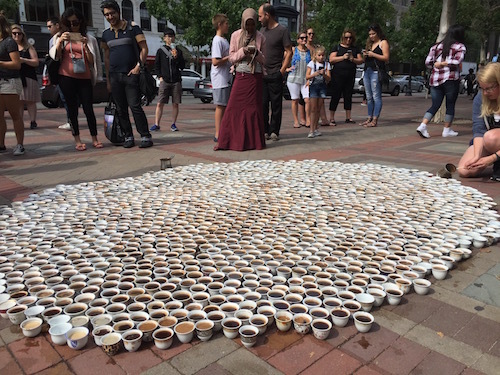 The Srebrenica memorial installation forms over the space of several hours, beginning with coffee poured into one of the small porcelain cups, fildžani, in which it is typically served across the former Yugoslavia. 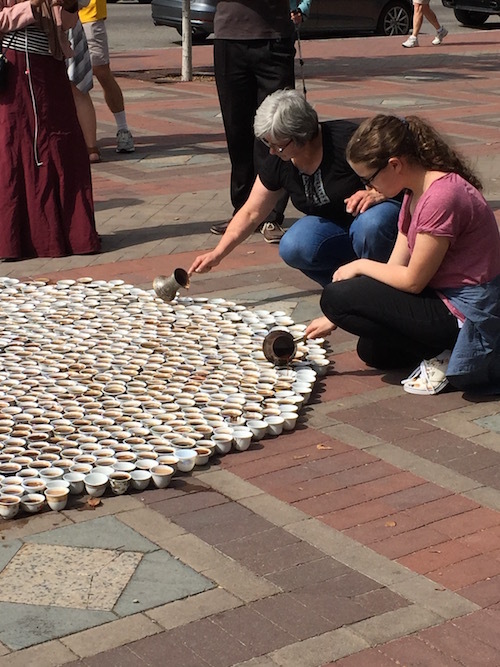 The installation grows over the course of the day, one cup for each person killed at Srebrenica, placed into an ever-widening circle, and filled with coffee. Volunteers engage the passing public about what happened in July 1995, and invite them to join the project by placing a cup and filling it with coffee. The mood is not somber, but it is serious and prompts a conversation amongst strangers. The installation does not engage in the historical or political intricacies, or to permanently re-fashion Srebrenica unto a public landscape. It is modest, and the more moving for being so. It grows and takes shape in relation to the unexpected conversations, in this case, between a community of Bosnians displaced by war and violence with their new communities in Boston. The elegant simplicity of “Što Te Nema?” provides a helpful entry point for thinking about debates regarding the role and purpose of public memory projects, recently invigorated in response to David Rieff’s recently published In Praise of Forgetting. These memory projects, I argue, are best understood as situated between personal memory of survivors, on one hand, and official narratives of mass violence, on the other—reducible to neither. In the context of societies emerging from periods of systemic violence, there is a tension between the memories of those who directly suffered and bore the brunt of brutality – the sharpest cut of political experiences with widespread impact – and the larger society, regardless of how many people supported or were committed opponents of the authorities behind violence. Personal wounds, even if they heal, are unseemly and difficult to integrate. There is nothing redemptive in the fog of trauma that follows, the permanency of lost loved ones, or the shattered relationship with society that somehow never manages to totally forget that men are capable of the worst acts imaginable. For those who have suffered, there is no question of whether or not remember, memory is simply there. The questions are how is it there, how does individual memory relate to public memory (or truth-telling) projects, and from there to political agendas? Individual memories of violence, as opposed to history, form an irrational discourse, inherently subjective and unruly. [i] And as such, can form the basis of a public memory-work that is a powerful force for unraveling, or at least challenging, narratives that subordinate the experience of violence to the task of state-building. This remains true even if the new state appropriates the story of suffering into its rationalizing discourse, because to do so authorities must tame the memory and make it serve their ends, a task for which memory of violence is inherently ill-suited. A soft tremor and hot whisper goodbye, of final words from a father to his children has nothing to do with the discourse of truth or state-building; it exists in another language spoken only in the chasm of loss. It does not find redemption or resolution. How would one ever reconcile that final goodbye with the discourse of rights-holding individuals, civic trust, rule of law and reconciliation, constructed through truth-telling or memorialization projects? These are not the same forms of communication, not in any language. Living in the wake of personal loss, crafting public memory projects, and state building are fundamentally different tasks. This does not by any means install a hierarchy between them, but issues warning flares to all those who think that one can serve the others, for whatever purpose. One might ask, what if public engagement with memory-work produced no politically defined outcomes? What if it fostered a small space on the public sphere where memory of deep pain was simply honored—without any connection to a political program? Would this be a waste of time, and if so, whose time? Of course de Grieff is correct in some cases and Rieff in others. In the end, I am deeply agnostic about whether memorialization and truth-telling promote rights-respecting states or grievance fueled tyranny; because in some ways and in some places both sides are right. My point in this short essay is not to agree or disagree with either side of this debate. Rather, I want to lightly probe the point of intersection between the functioning of memory and public memorial projects, as a prior endeavor before we turn to policy matters (like civic trust and rule of law—reconciliation is something different). This trio of ideas– memory, memorial or truth-telling projects, and policy outcomes—complicate and unsettle each other. They should not be imagined as overlapping concepts or practices. There is a collective component of memory, if only at minimum because making sense of even personal memories is a task done in relation to social meaning. There may not be collective memory, as Rieff often argues and de Grieff agrees, but memory is filtered through a web of meaning that is collectively constructed, with different stories gaining or losing significance in relation to what is heard and how it is received. Hence the work of addressing memory of violence is collective, even if it the trauma at its heart—what I described above as the sharpest cut — cannot be circumscribed by a collective narrative. The most powerful and difficult point at which memory penetrates into social discourses is not where it is subsumed into a new ethical or political narrative, but how long a society can listen and still resist the urge to subsume memory to politics. This is why I wonder if truth-telling and memorial projects should not be understood as producing transitions to more just political dispensations, but rather, if the effort to undertake such practices is an attribute of societies that are genuinely embarking on such a transition. [iii] The task then for supporters of transition is encourage the forces that demonstrate this attribute, rather than to be deterministic about its modes of enactment or incorporation into political regimes, something the field of transitional justice recognizes, but has not fully integrated into its practices. If, for no other reason, than because donors rarely support projects that cannot claim, however speculatively, to be valuable because they have no immediate use value. Memory is not policy. Nor are memory projects and public memorialization. To ask either to transform into policy is a form of forgetting. Memory is much quieter, simpler and, in political terms, often useless. And so it should be, but that in no way reduces its power. The place of memory projects is to intervene, interrupt and surprise, not to rebuild an edifice. The power of memorialization stems from this ethics of simplicity and interruption, not righteousness. In this I agree entirely with Rieff. Memory does not and cannot provide a map for the future. The potential for harm that Rieff discusses is not in memory projects per se, it is when they, their advocates or usurpers become boastful about how memory instructs.Memory is not the opposite of forgetting, these two ideas are, as many others have also noted, twins. Rather memory unravels and intervenes, it destabilizes; so its opposite is institutionalized narrative. Memory is most powerful when it makes little sense in relation to the ways we try to tame it, be that for reactionary or liberal narratives. This also means one must part ways with memory at some point, switch to another language once lesson learning and meaning extraction become the goals. This work is overtly and rightly political, and must stake its claims on those grounds. 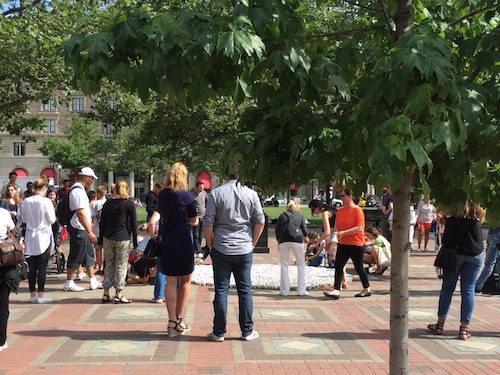 Even at a slight distance from the Srebrenica installation in Boston, it is almost impossible to discern what is happening. 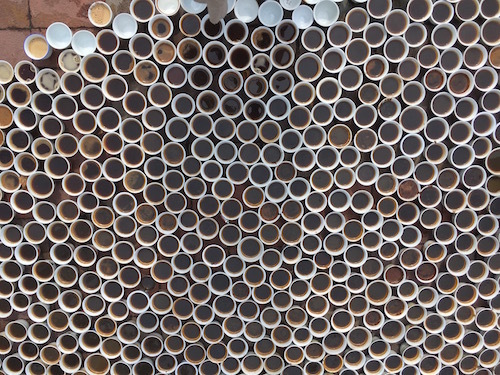 What work is being done here, around the fragile cups, spilt coffee, and an imperfect circle on the ground? 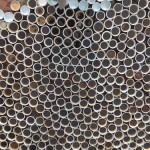 You cannot know what this is until you join the conversation and are invited to participate. Tomorrow, there will be no trace of this installation, but for one day it claims public space and creates an impromptu community of those who are willing to listen to the story of what happened in Srebrenica in July 1995. [i] I do not intend this to read in psychoanalytic terms, as, for instance, what Lacan refers to as the Real, which is (to put it crassly) a more elemental exposure to that which cannot be subsumed into cognitive experience. Such discourse is relevant here, but is not my focus. I simply refer to memory as an individual’s story or accounting of their personal experiences of violence. [ii] This is quoted from a compelling engagement between Rieff, De Grieff and others hosted by the International Center for Transitional Justice. [iii] This is a point further suggested by cross-case studies of transitional justice, which demonstrate that there is no formulaic outcome produced by various mechanisms, but rather that the strongest outcomes result when multiple forms, which can include amnesties, are deployed. This suggests that a society willing to engage the questions of post-conflict justice and to attempt to grapple with the challenges rather than simply implement a transitional justice tool are those best positioned to achieve democratic gains.